Technologies of Insecurity examines how general social and political concerns about terrorism, crime, migration and globalization are translated into concrete practices of securitisation of everyday life. Who are we afraid of in a globalizing world? How are issues of safety and security constructed and addressed by various local actors and embodied in a variety of surveillance systems? 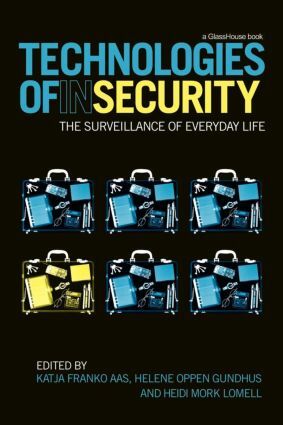 Examining how various forms of contemporary insecurity are translated into, and reduced to, issues of surveillance and social control, this book explores a variety of practical and cultural aspects of technological control, as well as the discourses about safety and security surrounding them. (In)security is a politically and socially constructed phenomenon, with a variety of meanings and modalities. And, exploring the inherent duality and dialectics between our striving for security and the simultaneous production of insecurity, Technologies of Insecurity considers how mundane objects and activities are becoming bearers of risks which need to be neutralised. As ordinary arenas - such as the workplace, the city centre, the football stadium, the airport, and the internet - are imbued with various notions of risk and danger and subject to changing public attitudes and sensibilities, the critical deconstruction of the nexus between everyday surveillance and (in)security pursued here provides important new insights about how broader political issues are translated into concrete and local practices of social control and exclusion.